The lowest level of skeleton dancers are the Ging. 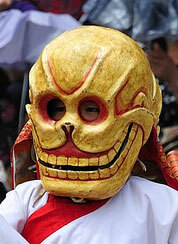 Ging are boy monks who dance in a basic costume and skull mask. 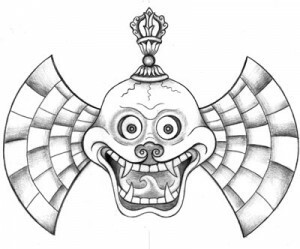 They play a semi-comical character and have no skull diadem and no ear decorations, no adornments of any kind. This can be considered the entry-level of skeleton dancers. The mid-level skeleton dancers are he Gangre. 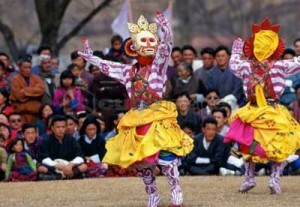 Gangre skull mask dancers wear a single skull or Vajra on top of their heads, and colorful ear decorations besides their ears. They also wear a colorful costume. 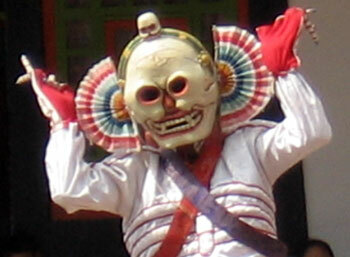 The Gangre dancers usually dance as a pair or a group of four and they are seen as helpers. Carmen’s drawing above is that of a Gangre mask. The highest level of skeleton dancers are the Citipati skeletons, who always dance in pair of male & female. 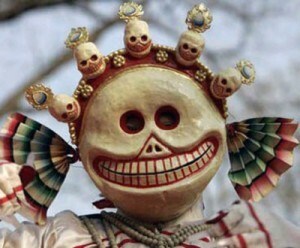 They wear a diademe with 5 small skulls and their clothes are mainly red and white in color.